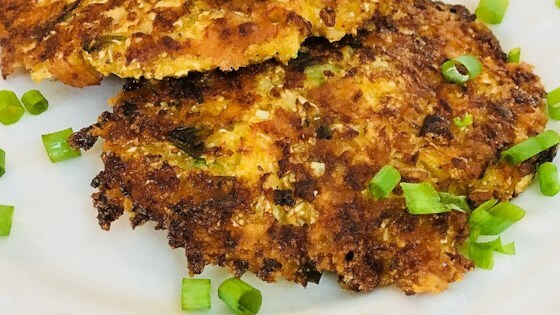 "Cauliflower takes the place of potatoes in this low-carb version of hash browns held together with sharp Cheddar cheese." Place grated cauliflower, Cheddar cheese, egg, panko, green onion, salt, pepper, and paprika in a large bowl. Mix until combined; mixture will be very crumbly. Heat olive oil in a large skillet over medium-high heat until hot. Scoop up some of the cauliflower mixture using an ice cream scoop; pat into a flat patty. Gently place patty in the hot oil; reduce heat to medium. Repeat with remaining mixture. Cook until a golden brown crust forms, about 5 minutes per side. Remove to a platter and serve immediately. I have added this to my cauliflower steaks recipes. Happy to know you. Why am I the only one commenting on your recipe? Glad I'm the first.